This Campaign To Ban Animal Testing Will Melt Your Heart! The world’s first animal protest took place outside the headquarters of the United Nations in New York. But instead of just us, the protest included dogs of different breeds and sizes, with messages in support of Forever Against Animal Testing. A hard-hitting message, these puppers represent all animals as a whole and managed to get our attention to the shocking fact. 80% of countries worldwide still have no laws banning cosmetic animal tests. Research suggests that suggests that at least 115 million animals may be used in experiments worldwide each year. Animal experiments are sadly not on the decline, this is a global issue that deserves your attention and support. This campaign by The Body Shop was in association with Cruelty Free International has definitely managed to get our attention. 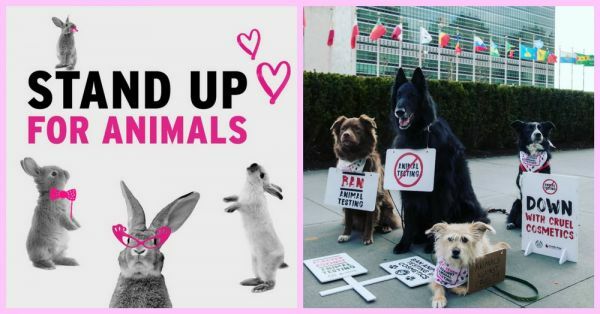 8 adorable pups took to the streets with protest signs, bandanas and miniature banners to show their support against animal testing. The goal for the campaign is to reach 8 million signatures for their global petition. On completion the 8 million signatures, the petition will be presented to the UN to call for an international convention to ban animal testing on cosmetics globally. This would help millions and millions of animals around the world. “Today’s protest sends a strong message to consumers and brands around the world that we need their support," says Michelle Thew, CEO of Cruelty Free International. We have made huge progress towards our goal of banning animal testing for cosmetics, but there is still work to be done. We want to see every company that is against animal testing pledge their support and encourage their customers to do the same”. The campaign is currently at 4.1 million signatures. You can show your support here.